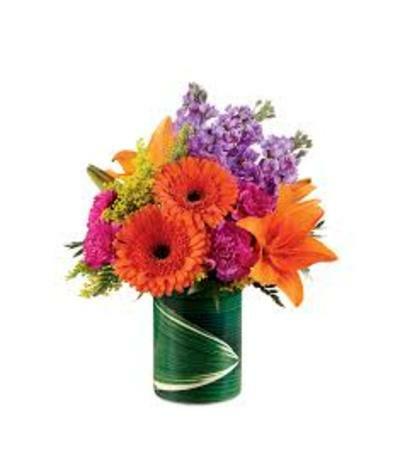 Take a quick and fun spin around the color wheel with a bouquet of bright, vibrant shades spanning a sunset spectrum from orange through purple. 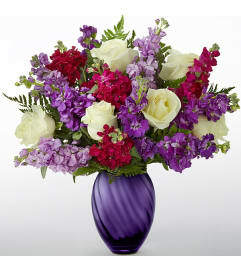 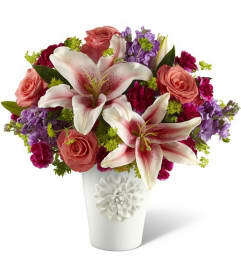 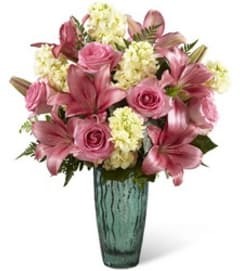 Orange roses (in Better, Best, Exquisite), Asiatic lilies, Gerbera daisies (in Good only), magenta carnations, purple stock and more are arranged in a ceramic "illusion" vase that convincingly replicates the look of a leaf-lined glass pillar. 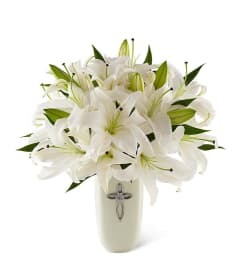 It's an arrangement sure to make some lucky someone's day while burnishing your credentials as a most creative gift giver.